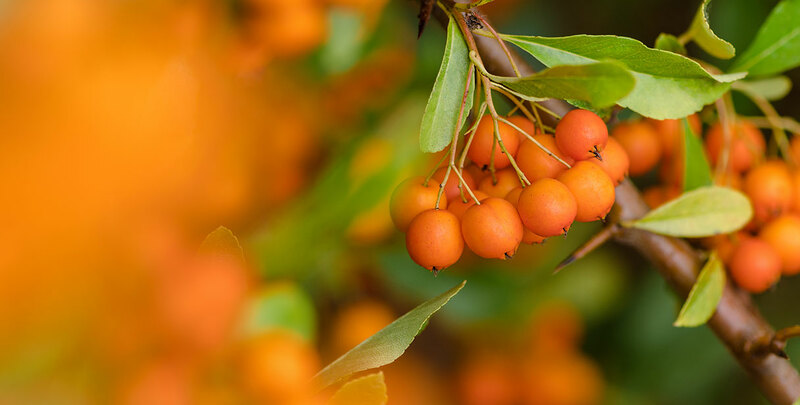 Firethorn ‘Orange Glow’, or pyracantha coccinea ‘Orange Glow’ by its Latin name, is a spring flowering hedging plant. After flowering in May/June, firethorn ‘Orange Glow’ produces an abundance of striking bright orange berries that make it an attractive intruder hedge, freestanding shrub or, alternatively, decoration of a bare wall. The leaves are small and glossy dark green in colour and the branches are equipped with prickly thorns, which enables pyracantha hedges to deter unwanted visitors of all sorts. The berries, which last well into winter, are very attractive to birds, while the dense clusters of white flowers in spring are an abundant food source for bees and other pollinators. Firethorn ‘Orange Glow’ is a very wildlife friendly choice in terms of food, but also provides plenty of nesting opportunities to birds. This vigorous hedging species can grow around 20cm a year, which is considered moderate/average, remaining dense and compact until reaching its ultimate height of 1.5m. Regular annual prunings (at least once, preferably right after flowering) are only necessary if you wish to have a dense screening hedge. Less pruning will result in a less formal and less compact hedge, however, should you change your mind, overgrown hedges can be pruned back rigorously. This spiny evergreen shrub can handle demanding conditions, including shade and somewhat exposed locations, and will take any well-drained – preferably fertile – soil. But full sun or light shade are the most favourable conditions.